To lock the corner casters in place simply engage the latch. 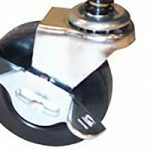 Our dividers are supported by self-leveling casters. When you’re ready, pedal brakes keep the divider locked into place.